Play Gems Odyssey at Vegas Spins and level up by catching the biggest prizes! Having an RTP of 94.50%, you are bound to win big on this adventurous arcade game. Developed by Skillzzgaming, Gems Odyssey is a 5x5 grid game that is packed with a number of different coloured gems and rewards. This game hides the most prized jewel, the Nebula gem until you find and claim it. Simply match three similar symbols to unveil the most precious gems. 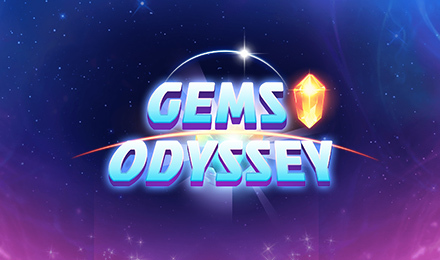 Take in the marvellous view of shining starts in the background of Gems Odyssey then level up and collect the biggest prizes the game has to offer. With an RTP of 94.50%, there’s no way you’ll leave this game without being a winner.